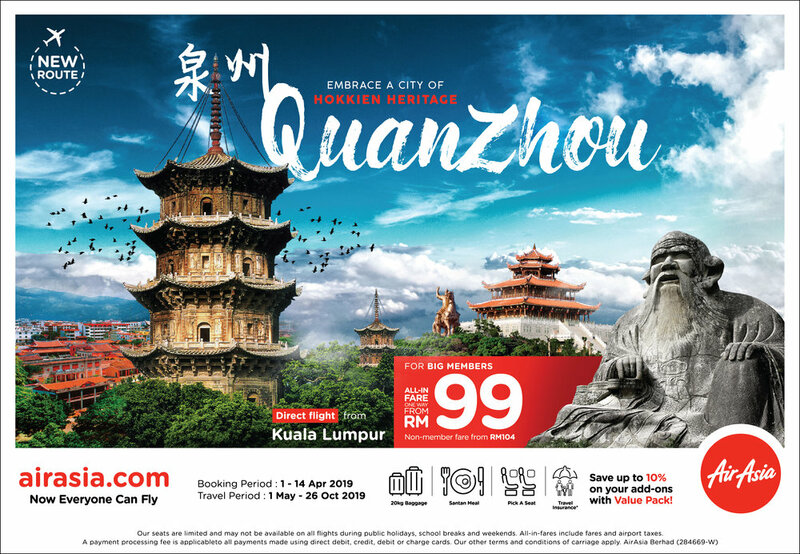 SEPANG, 1 April 2019 - AirAsia is set to fly to Quanzhou in Fujian, China with a daily direct service from Kuala Lumpur commencing 1 May 2019. Once one of the world’s biggest ports and the starting point of the Maritime Silk Road, Quanzhou was known to Arab traders as Zaiton and was praised by Marco Polo as the “one of the two greatest havens in the world for commerce”. To celebrate the route launch, AirAsia is offering promotional all-in-fares from RM99*. Book at airasia.com or via the AirAsia mobile app from now until 14 April 2019, for travel from 1 May 2019 to 26 October 2019. Must visit attractions in Quanzhou include Kaiyuan Temple, the largest Buddhist temple in Fujian, built over 1,300 years ago; Qingjing Mosque, China’s oldest Arab-style mosque, which was inspired by the Umayyad Mosque in Damascus; Luoyang Bridge, one of the “Four Ancient Bridges of China” that resembles a silver dragon lying above the green water, and many more. Guests can also visit the nearby city of Xiamen, located only 1 hour away by high-speed train. * Promotional all-in-fares quoted are AirAsia member only fares for one-way travel inclusive of taxes. Refer to Terms and Conditions here.